Yes! Go Queen Vicky!!! I am with her. This is a charming illustration. 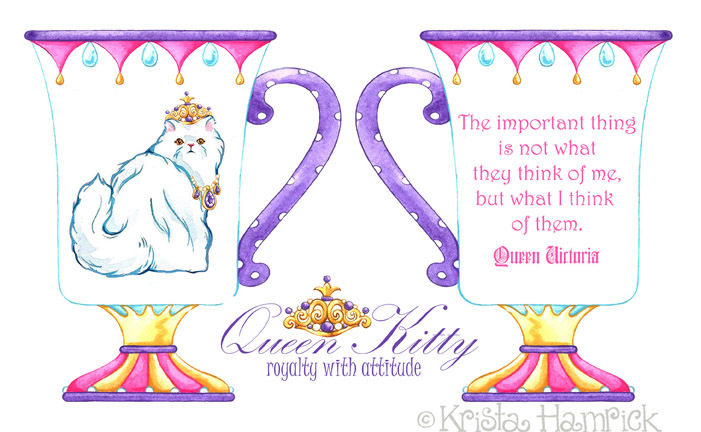 Why are cats associated with aristocracy? Heh, heh. Well if I was queen victoria I wouldn’t have looked in the mirror any more than I do now. Do you know that she had three really long hairs growing from the left hand side of her chin for most of her life after Albert died – and no-one was game to tell her to her face? She actually broke her hip after tripping on one of the hairs, and while she was under sdetaion the brave anaethetist (a Doctor Robbins) snipped them off on the pretext that they were stuck under her mask. You can still see the three hairs on display in the Victoria and Albert Museum in London. Cats do think they’re the best that’s why I love them. Lovely work! Great quote and perfect illustration! Love your kitty Krista!! The color contrasts really make it pop! Your work is always amazing. You put the “zing” in amazing! Oh, I can soooooooooo relate. 😉 Fantastic! Have a great weekend! great quote – fantastic illustration! LOVIN’ it. Enjoy your weekend. Hi Krista! I’ve admired your work on Two Town’s site for ages, thanks for visiting my blog this morning!